Lisa Le Brocq is a local jewellery designer and silversmith. At this time of year, she is working hard producing her very popular range of festive jewellery. 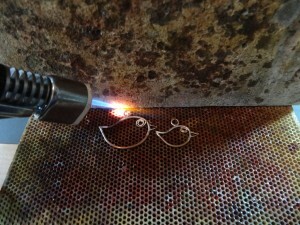 Lisa was kind enough to walk us through her process of creating a sterling silver Christmas Robin. 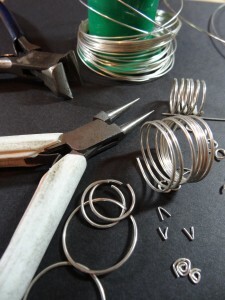 It’s fascinating to see how a length of silver wire becomes a piece of beautiful jewellery, full of Christmas character. 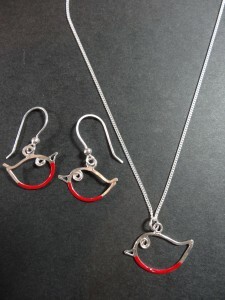 Lisa uses various gauges of sterling silver wire to make her Christmas Robin jewellery. The robins are available in a small (1cm) medium (1.5cm) or large (2cm) size, for use on either necklaces or ear-rings. Small pieces of wire are cut and shaped using pliers and wire cutters to make the small swoosh shape of the birds body. 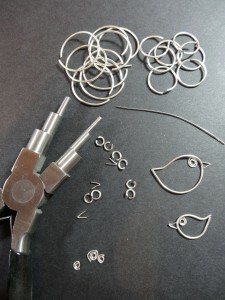 Then tiny lengths of the wire are cut and formed into spirals for the robins eyes, and tiny v-shapes for the beaks, and the small hanging loop for the top of the bird. These pieces are only millimetres across. 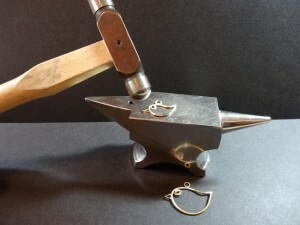 Each small piece of the bird is carefully laid into position, special attention is paid to the placing of the eye and beak to give the bird character, then all the pieces are soldered together. Once the bird pieces have been fixed together, Lisa uses a small hammer and anvil to flatten the bird shape and give a smooth finish. Lisa forges out areas like the birds chest to emphasis the rounded robin shape. After the bird has been shaped and smoothed, it is given a thorough polish so that the silver shines beautifully. Then a small amount of red enamel paint is added to the breast of the bird to give it the distinctive look of a Christmas Robin. Lisa’s beautifully hand crafted robin jewellery is available from a range of outlets on the island: Jane James Coastal Ceramics, St Helier and Gorey. The Durrell Wildlife Visitor Centre, Trinity. Harbour Gallery, St Aubin. During La Fête dé Noué celebrations you can find Lisa and her work at Simply Christmas at Greve de Lecq Barracks on 30 Nov and 1 Dec. Also, at the Spirit of Christmas market in Weighbridge Place from 5-8 December Lisa will be selling her jewellery as well as making pieces so you will be able to watch her process as she creates various designs. To follow Lisa’s progress and be amongst the first to see new designs “Like” her Facebook Page here.